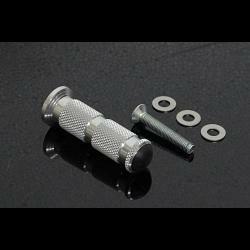 Replacement foot peg for your TYGA Step Kit, short type. Complete with M8x55 taper socket bolt for mounting and 3x 8mm washers. Ideal for racing for better clearance when fully leant over. We recommend securing with thread locking agent to resist vibration. Notify me of updates to Tyga Step Kit Replacement Foot Peg (Short Type), Assy.